It just starting to snow where I live and so it really is starting to look a lot like Christmas!!! Maybe you’re think, “Start a business in December…are you crazy? There are so many things going on at Christmas!” But that is a great reason to start your business!!! Think about it… people are in the spirit of getting together and buying gifts and or wanting to freshen up their own kitchen tools (cloths, scrubbers, hand towels etc.) as it is the Christmas hosting season. 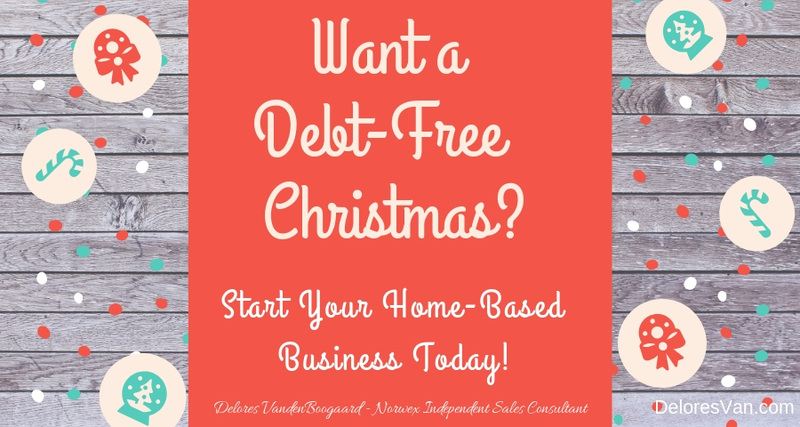 Plus, wouldn’t it AMAZING to get through Christmas without debt? Imagine that… Keep reading, this month there are some AMAZING incentives when you sign up. STANDARD PARTY STARTER KIT (with BONUS)! Every new Norwex consultant needs a variety of product to try and demonstrate. This Standard Party Starter Kit is designed to fulfill those needs. It’s your basic kit… it contains the top-10 selling items and some essential business supplies. 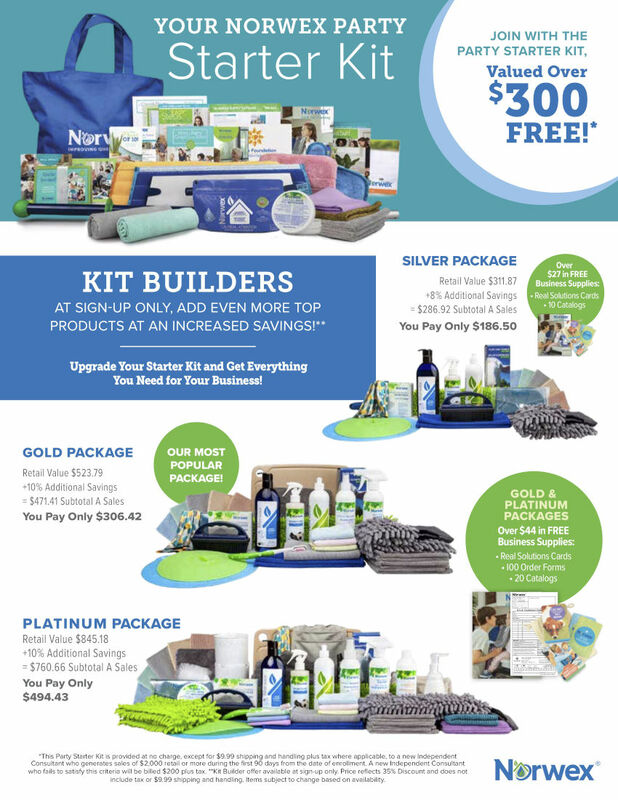 The Kit costs $200… but the great news is that Norwex gives you an opportunity to earn it for FREE. First, the kit itself is actually worth more than $300. 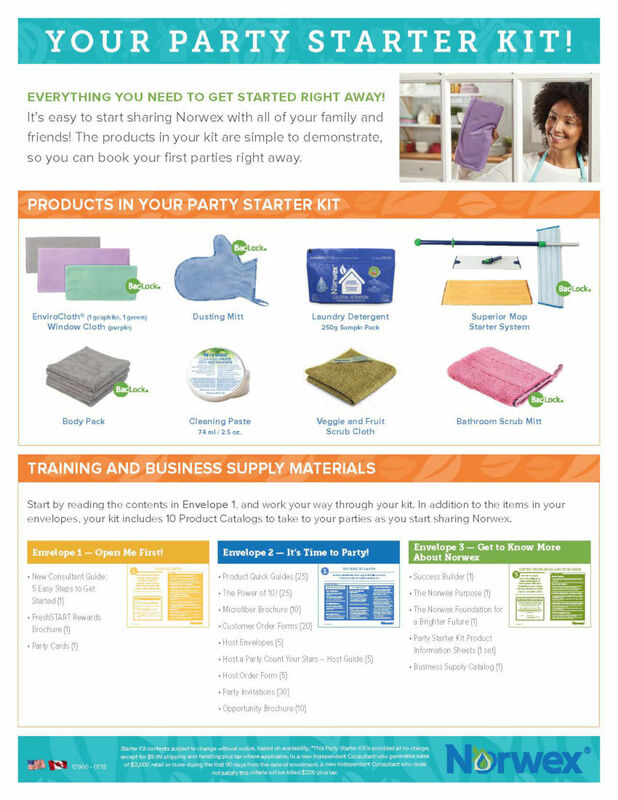 Second, when you sell $2000 in your first 90 days of business, Norwex gives you the kit for FREE! Use those 4 Bonus travel-sized EnviroCloths to help you grow your business. Give them to a friend or family member who has never used Norwex and explain to them the benefits of cleaning with Microfiber and water. A gift is a great conversation starter. An average party sells $500 in product… that means you need to host 2 Launch Parties (you will receive Host Rewards, earn 40% commission on every sale, work towards your $2000 goal, work towards your FreshSTART Step 1 (with BONUS $75 Shopping Spree) and ask 2 friends to host your next parties. 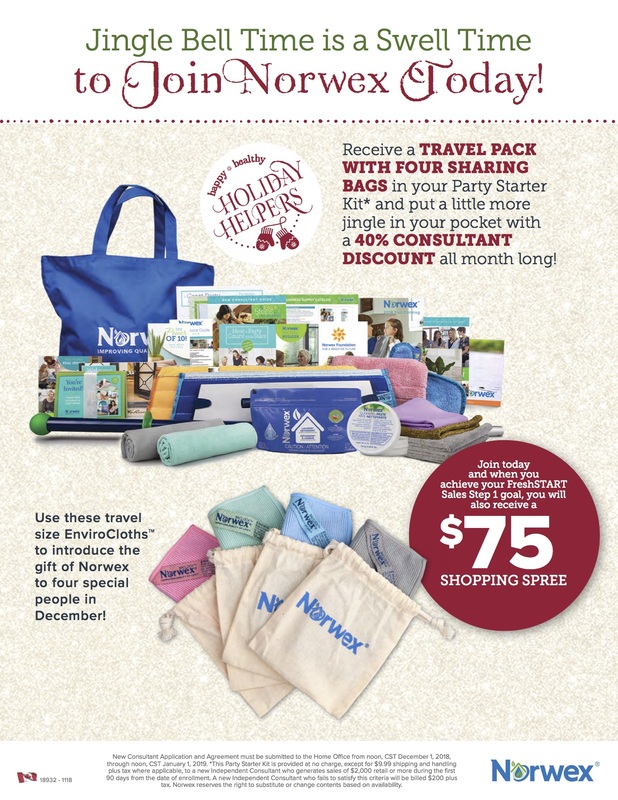 Invite everyone you know to your launch parties… both local and across the country (Norwex ships direct). Use Social Media, face-to-face, phone call, text to let your people you have launched your business! When you sell $2000… you will have made $800 in commission (plus lots of other rewards) and got your business off to a strong start. 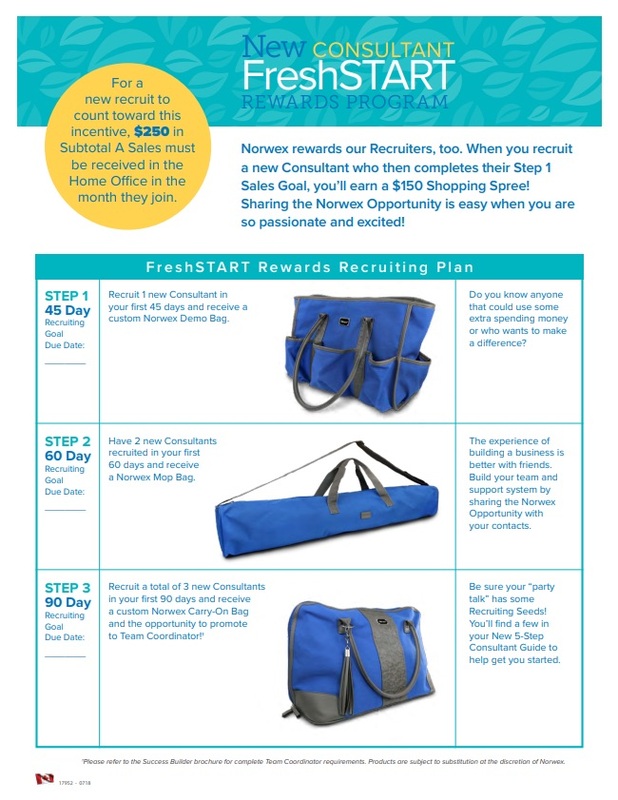 Norwex’s FreshSTART Program is only for new consultants and it is designed to help consultants succeed! It sets attainable sales and recruiting goals to be reached within the first 60-90 days of business and the rewards are AWESOME! When you complete all 3 steps, you will earn $800 Income (40% commission), $592 Free Product and the Standard Party Starter Kit for FREE! PLUS, this month Norwex has added a $75 Shopping Spree with the completion of STEP 1! So you know it is important to own product to demonstrate… but it is also important to own and use Norwex products in your own home. Why? I have found that consultants who use the product, sell more of it! Personal testimonies are so powerful because they are honest and sincere. The Kit Builders are available only for new consultants and they provide an EXCELLENT way to buy product at a fantastic price. There are 3 kits, but the Gold Package is my FAVOURITE. Why? 1. Its stocked with lots of my favourite products (plus business supplies). 2. You can purchase it at 45% off retail price. 3. It earns you your STEP 1 FreshSTART Sales Goal ($400 sales in first 15 days of business)… which qualifies you for another $135 in Free Product. Check out all the kits to see what suits your needs! The second part of the FreshSTART program is all about GROWING your business. I know it sounds early… you haven’t even signed up yet, but start thinking about inviting a friend to join with you… as a start. Do you know anyone who loves Norwex products like you? Do you have a friend who could use some extra Christmas income? This is the person to invite (and then get rewarded). I started my Norwex business 12 years ago and one of my favourite things is working with like-minded people… I love to grow and learn along side fellow consultants on my team. It’s the best way to do it. What are some of your reasons for signing up with Norwex?